A Marine Surveyor is retained by a client (boat owner or boat buyer) to verify the value, condition, construction and safety of a vessel as per the American Boat & Yacht Council standards & U.S. Code of Federal Regulations. At the present time, four organizations certify Marine Surveyors, S.A.M.S., N.A.M.S., A.C.M.S and U.S.S.A. Each have there own standards and are recognized by most lenders and insurance companies (no federal license is required). complex fuel injection system and higher compression ratios need a factory trained technician to ascertain the condition of the engine). While many of the above may seem to be common sense there are specific details that may make your boat not only unsafe, but also un-insurable. B) Next the Surveyor will inspect the boat’s Hull – checking for water intrusion in the foam core and transom laminates. Some manufactures build a monolithic cored transom, then make a large cut out for the stern drive often leaving unsealed plywood surfaces (see my photo). 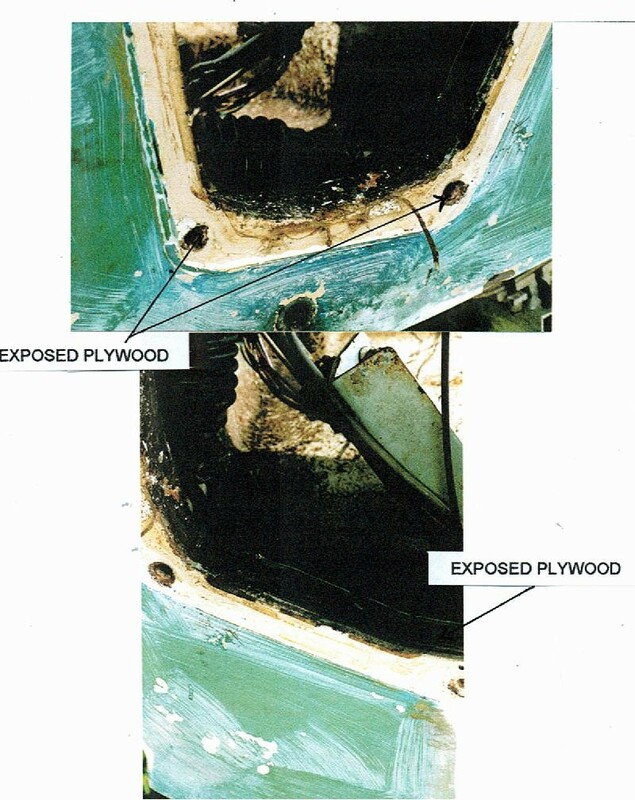 Improper installation of any screws or bolts can also allow water to enter the hull coring. To determine if this has happened the Surveyor has two techniques to find moisture in the laminates. The old method is tapping with a hammer and listening to the hull sound. The new Higher Tech way is to use a Capacitance Moisture Meter (not a wood type Resistance Moisture Meter). This testing can tell you if you are likely to need high price fiber glass repairs in the future. C) The Stern Drive is now the subject of out of the water inspection. The Surveyor will look at the lower gear case very carefully. Bondo and spray paint can skillfully cover up impact damage (hit a rock!). Pressure testing and vacuum testing the lower gear unit will indicate the integrity of the shaft seals. The prop shaft should be tested with a Dial Indicator; most manufactures allow only a .003″ to .005″ shaft run out. D) The Surveyor will now get real serious and check out the boats performance with a Sea Trial. The vessel should achieve the engine manufactures rated RPM, without over-heating for at least a half hour run! The installed dial tachometer will be compared to a calibrated digital Photo Tach or digital Inductive Tach (installed dial tachs are notoriously inaccurate). Temperatures can be compared to a laser infrared Thermometer or a calibrated HG lab Thermometer. Boat speed can be established by hand held GPS or by the old fashioned, but accurate stop watch method. A Surveyor will usually charge by the foot (between $30 – $50 a foot), but it is money well spent compared to the price of replacing a drive or an engine.